It’s been a busy summer here at Echo-Factory, and we’re excited to share one of our recently completed projects: the R.W. Lyall & Company rebrand. Headquartered in Corona, California, with a factory in New Berlin, Wisconsin, Lyall is a family-owned-and-operated business manufacturing pipeline component products for the North American oil and gas industry. With sales territory stretching across the continental United States, a new and bigger Wisconsin facility, and a push to enter new markets, Lyall needed to update its brand image to better reflect its position as a market leader. Their outdated promotional materials did not accurately reflect their capabilities, and their website needed to be redesigned and reorganized to offer a more expansive view of their technological expertise. The site also needed to be refined to better serve as a sales tool and lead funnel. The Echo-Factory team started by updating the Lyall logo with a new typeface and font, adjusting the placement of the flame to work in new digital formats. We also rebranded Lyall’s marketing communications, presentations and product brochures, refreshing the copy and giving them a clean, sophisticated look. And finally, we completely redesigned and rebuilt the Lyall website. The new site features custom photography of products and manufacturing processes and expanded overviews of all the markets that Lyall serves. Downloadable product brochures, detailed illustrations of product applications, and installation instruction videos enhance the user experience. The site is more easily navigable and is designed to take advantage of all current SEO and SEM opportunities. 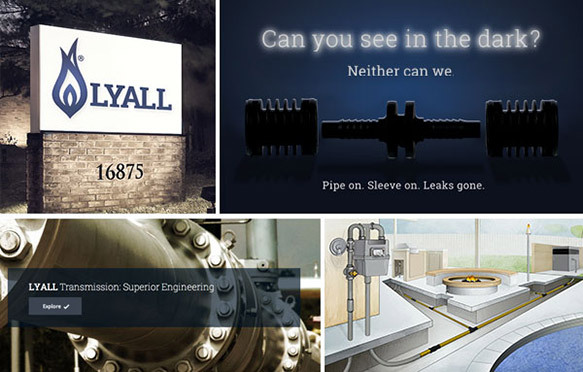 Lyall now has promotional materials that reflect who they are—an industry leader poised for growth and expansion. We are proud of the work we have done thus far and are grateful for the opportunity to work with such a great business. Stay tuned for more updates on the latest projects from our growing portfolio.